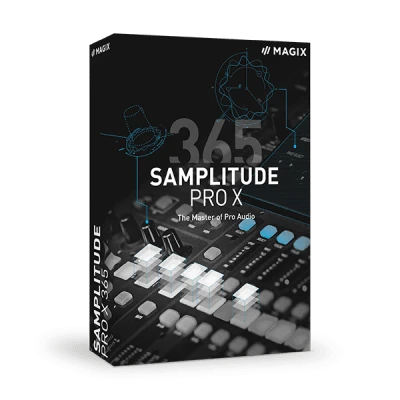 Samplitude Pro X 365 provides the highest level of quality for recording, mixing and mastering tasks, as well as for music production. With professional effects, efficient editing functions, as well as a powerful audio engine, the latest version continues to set new standards in the professional audio sector. Discover all the functions in Samplitude Pro X4 Suite including SpectraLayers Pro 5 and SOUND FORGE Pro 11 – available now at an unbeatable price. Work at the highest level of audio quality, even in complex recording sessions. Absolute sound neutrality and optimal latency management enable professional, ultra-precise studio recording. Extensive options for producing scores, advanced functionality for MIDI editing and numerous virtual instruments. There's inspiration in each and every high-quality detail. Record complex projects and work on large arrangements with intuitive mixing, flexible routing and seamless automations. The high-quality mastering effects offer optimal support for mixing and mastering. Work with individual sounds in an audio file fully visually. SpectraLayers Pro 5 sets itself apart with its one-of-a-kind layer concept for the frequency spectrum, which lays the groundwork for sophisticated sound editing and professional-level mastering. Take advantage of all the additional features in Samplitude Pro X4 Suite, such as the Cleaning & Restoration Suite, the MP3/AAC preview plug-on and 5 additional software instruments. The 12-month version also includes the full version of SpectraLayers Pro 5 and SOUND FORGE Pro 11. After you install the software using a license, you can use all program functions offline. An Internet connection is required only for updates and the monthly validation of your software. What will happen to the projects I've already created? You projects remain safe even if you decide to end or suspend your subscription. This means that if you want to continue working on a project after your subscription has expired, you can simply renew your subscription and then reopen the project to continue editing it. You can also open a project created in Samplitude Pro X 365 in your regular Samplitude Pro X software, as long as you have the same version as the version in which you created the project, or a higher version (e.g. if the project was created in Samplitude Pro X 365 version 4, you can open it with your regular Samplitude Pro X4 version or a higher version). How do I manage updates? Do I need to install the latest update right away? No You can install the current version of the product whenever you want. If your subscription is active and valid, it's up to you to decide if and when you want to install a new version. What will happen to my current version of Samplitude Pro X? Nothing. You can use Samplitude Pro X 365 parallel to other software versions. This video outlines the essentials in Samplitude to help you get started. We'll start by using a demo song to give you an overview of the program interface, object-based and track-based audio editing and the mixer. Then, we'll demonstrate how to create a project, use VSTi instruments and record using Samplitude. "I almost do everything starting from the draft of a composition over arrangement, recordings through MIDI and sound design to the final mixing and mastering process." "I feel nothing can replace what Samplitude and Sequoia do for me, they are all I use and all I need." "I’ve been using Samplitude and Sequoia for almost 20 years now, and I can’t imagine working without them." "The quality of Samplitude is truly remarkable. It’s power and flexibility is without compare and most importantly — it sounds great!" "I've chosen Samplitude because some of my friends were using it, even in the classical music domain, and were raving about its sound quality." "It’s all super quick and easy with Samplitude." "It’s so simple, yet it has everything you can dream of and looks great on screen." "From the ability to visualize your audio to delivery, it is hands-down the best tool for the job." "I love Samplitude’s object-based processing, and the cut feature with automatic fades." "The overall vibe of editing is also fantastic, and the application has just always been super snappy and responsive."